JEFFERSON CITY, Mo. 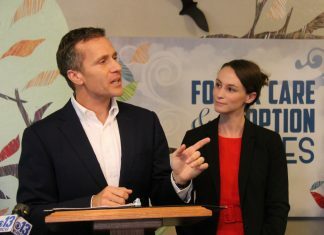 — First Lady Sheena Greitens is pleased with some of the work done by legislators this session, which she believes will have a positive impact for Missouri’s foster care and adoption systems. Greitens on Monday posted a statement on social media regarding the passage of SB 819 and SB 800, two bills dealing with those particular topics that managed to pass both chambers before Friday’s deadline. The legislation would enact a number of new policies, including language to improve the sharing of information across state lines, strengthening of provisions for terminated parental rights in the case of sexual abuse, a timeline for the establishing of paternity, and the streaming of processes for kids who have been exposed to alcohol and drugs. It also looks to create the fingerprinting and background check process safer, while protecting the privacy of foster families’ medical, financial and other personal information. In addition to that, it also sets up a task force to review and improve how foster parents are licensed, retained, and recruited. It also allows private attorneys to file for the termination of parental rights and adoption, an effort to combat the backlog of more than 1,300 foster children who have families already identified but uncompleted paperwork.